GEORGE BERNARD SHAW Autograph Letter Signed. Irish playwright, critic and political activist. 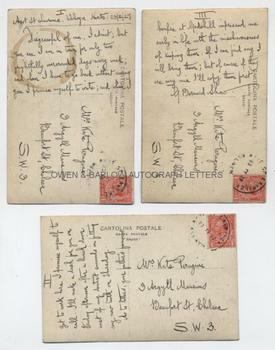 ALS written on the verso of three post-card real photographs of the author. Ayot St Lawrence, Welwyn, Herts. 23rd February 1927. To Kate Perugini (the artist daughter of Charles Dickens). "Disgraceful of me, I admit; but you see I am in town for only two frightfully overcrowded days every week; and when I have to go back without seeing you I promise myself to write; and when I get to work here I promise myself to call. I'll make a dash for you on Friday afternoon after a lunch down west if my dentist succeeds in fitting my new teeth on Thursday. As to letters, your father's famous bonfire at Gads Hill impressed me early in life with the mischievousness of keeping them. If I can find any I will bring them; but of course if they are very nice I'll copy them first. G. Bernard Shaw." The three post-cards each measure approx 5.5 x 3.5 inches and each is separately addressed and franked. 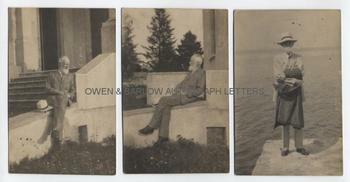 They show three separate real photograph portraits of George Bernard Shaw in relaxed informal poses and were probably taken in Italy. One post-card has a circular stain from a coffee cup but they are otherwise in fine condition. Kate Perugini was the youngest daughter of Charles Dickens and is said to have been her father's favourite. She was married first to Charles Collins, the younger brother of Wilkie Collins, and after his death to the artist Charles Perugini. Kate became an accomplished artist in her own right and exhibited at the Royal Academy from 1877. She was a primary source of biographical information about her father (including his hitherto unknown affair with the actress Ellen Ternan) and was the subject of Gladys Storey's book 'Dickens and Daughter'. She became a close friend of George Bernard Shaw and also of J M Barrie. In 1927, George Bernard Shaw was working on his political masterpiece 'The Intelligent Woman's Guide to Socialism and Capitalism' which was published in the following year.